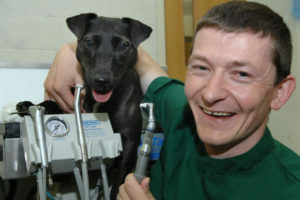 Our pets rely on us to make sure that their teeth and oral health are in good order. They are not able to brush their teeth twice daily and take themselves off to the dentist every 6 months as we do, so we must take care of their teeth for them. Throughout March we are offering free dental checks with a qualified veterinary nurse who can check your pets teeth, give you advice on preventative dental care and provide you with a complimentary finger brush to help you get started. 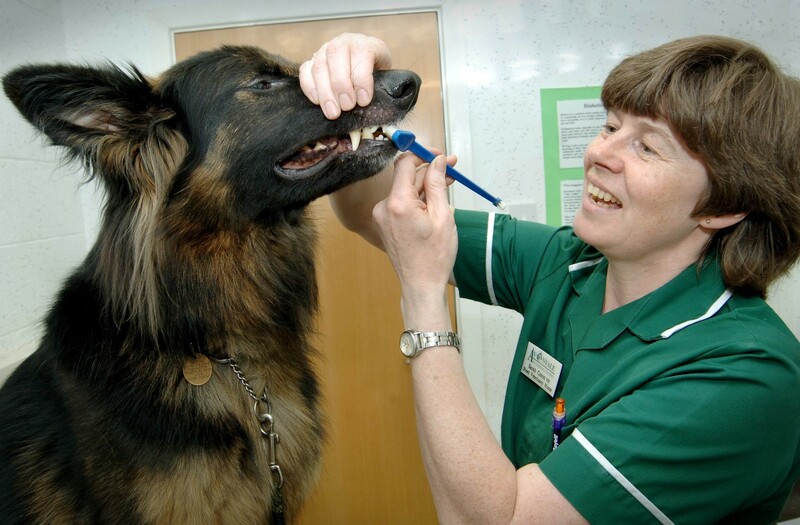 For pets requiring further treatment, we are offering 20% off dental treatment during March. Keep an eye out for further tips and advice on dental care on our website and Facebook page. 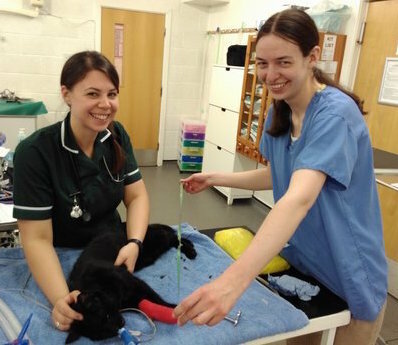 Poor Jasper was seen out of hours by Warwick vet Helen this week after swallowing a long piece of ribbon. He has played with the ribbon for years without any problems, but this time his owner saw the end of the ribbon in Jasper’s mouth and called us straight away. 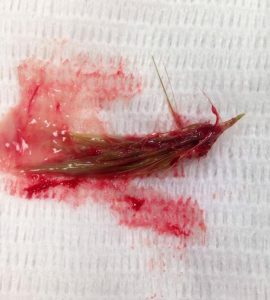 Helen advised we see Jasper as soon as possible before the ribbon became lodged in his intestines- this would have caused a lot of damage and could have led to peritonitis which would have made him very unwell. 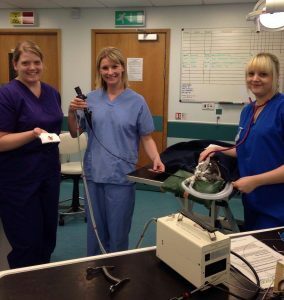 Jasper was given a general anaesthetic which was closely monitored by veterinary nurse Maddi. Helen passed a camera (endoscope) down into Jaspers stomach to see if the ribbon was still there; if it had passed through the stomach into the intestine Jasper would have to have surgery to remove it. Fortunately, the ribbon was still in his stomach so Helen was able to remove it using the endoscope meaning Jasper didn’t need surgery. Once it was removed Helen and Maddi found that the ribbon was almost 3 feet long, which can’t have been easy for him to swallow! Jasper recovered very well from his anaesthetic and went home the next day. Hopefully he has learned his lesson and won’t eat any more ribbons! In our second blog on obesity in cats, veterinary nurse Maddi discusses ways to keep your cat active and cut the calories. Getting your cat to lose weight can be a very difficult task, especially if your cat is particularly lazy! As you may expect, the best way for your cat lose excess weight is to help him eat less, and do more. However, as with so many things involving our feline friends, this is often easier said than done. Arguably the most important aspect of effective weight management is the quality and quantity of food that your cat fed. There are a wide variety of wet and dry foods available which have been specifically tailored to help with weight loss. Often these contain higher levels of fibre to help your cat feel fuller for longer. 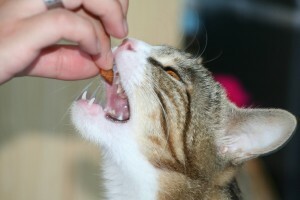 Portion size is also very important, and spreading your cat’s recommended daily allowance through three or four small meals is a good way to control your cat’s hunger. This can be effectively achieved through the use of an electronic feeder to minimise the impact on your busy working day. 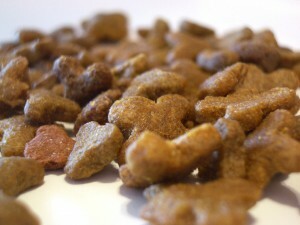 Of course, it is also vital to cut out any unnecessary treats, including titbits of human food (which is very fatty!) as these will only add to the calorie consumption. 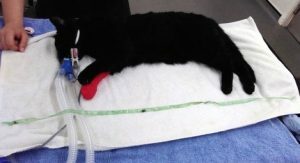 Once you have chosen a suitable diet for your cat, we then need to encourage your cat to move more. This can be done in various ways. One important way and probably the most enjoyable is to play with your cat. Cats will usually have a favourite type of toy that they enjoy playing with, but it is a good idea to change the type of toy you play with so that the cat doesn’t get bored. Try to avoid using treats to encourage them to play as this will add to the calorie consumption. One way around this is to take treats out of your cats daily allowance of dry food. If treats are the only way you can get your cat moving, then it is important that you compensate for this in the main meals of the day. It is best to Puzzle feeders and treat balls are useful if you are going to use treats and for solo play as they make the cat work for their treat! Another way to get your cat moving is to move their main meals around the house so they are not always fed in the same place every day. This will encourage natural foraging for food. 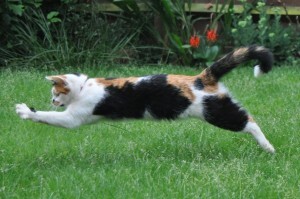 Remember, the move your cat moves the more willing they will be to move!